Ricardo Cárdenas is a successful emerging artist born in México. His career is growing as his exhibitions and rising popularity demonstrate. On his artworks Cardenas expresses his feelings and beliefs, connecting in media and technique with his career as a construction engineer. He cleverly uses building materials, such as concrete and steel bars, as his artistic media for his paintings and sculptures. Recently he has exhibited in important Art Fairs in the United States, presented by Contemporary Art Projects USA, such as Art Concept during Art Basel Miami week 2016, in Art Santa Fe, New Mexico, and in Art Palm Beach, in January 2017. In 2016 he also participated in the solo show Paramo at the art gallery of Miami Dade College West Campus, in Doral. Ricardo Cardenas is a genuine and original creator. He proves this with his exquisite series of tributes to great masters. Cardenas reinterprets as a poster or street graffiti the main traits of the art from a chosen master artist, using as his canvas the cement and iron bars characteristic of his work on which he will paint and also add collage. 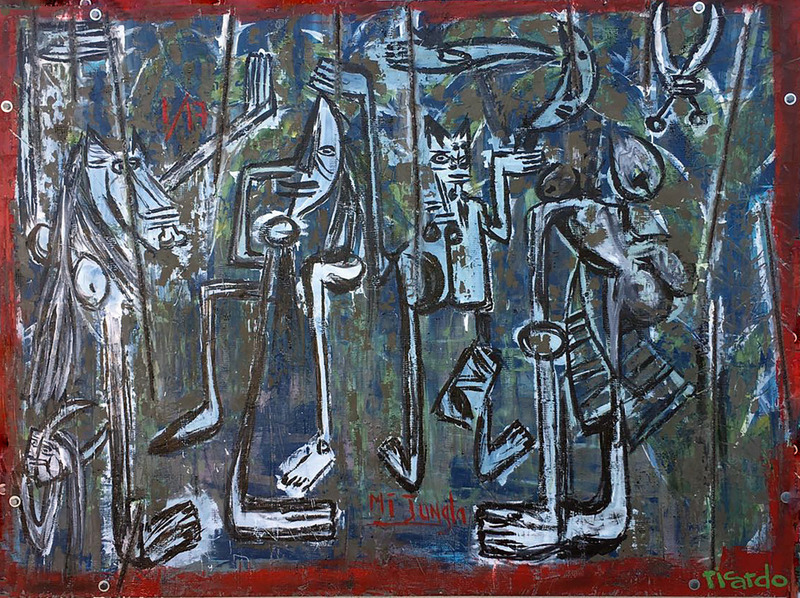 At Art Boca Raton, in the Contemporary Art Projects USA, Booth 108, Cardenas presents his unique artwork Mi Jungla: Tribute to Wilfredo Lam. He uses a red background on which he reinterprets some of the images depicted by Lam in his well-known masterwork The Jungle (1943) that is part of the MoMA New York collection. But in his artwork, Cardenas brings his interpretation to his media and technique, as well as to our present time. He uses steel bars for depicting the sugarcane fields and lives some parts as bare concrete, making his artwork to resemble a contemporary urban forest instead of a Cuban jungle. Yet, Cardenas uses the unforgettable imagery of Lam, but at the same time, he makes it his own. The tribute is just perfect, as the fusion that Cardenas successfully creates among the two artistic visions….